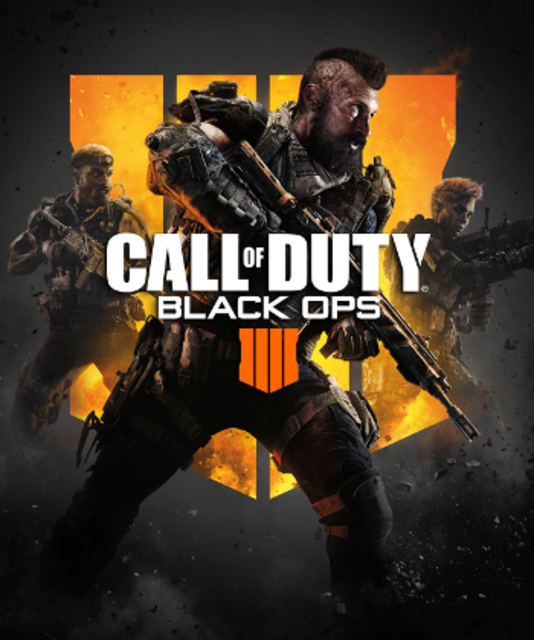 Call of Duty: Black Ops 4 (stylized as "Call of Duty: Black Ops IIII") is a sci-fi military first-person shooter developed by Treyarch and published by Activision for the Xbox One, PlayStation 4, and PC (digitally via Battle.net) on October 12, 2018. The fifteenth installment of the Call of Duty franchise (and the fourth in the studio's Black Ops series), Black Ops 4 is the first game in the entire series to not include a traditional campaign mode. Rather, the narrative of the game is focused on the series's competitive multiplayer mode (based on the Specialist system from Call of Duty: Black Ops III). It takes place between the events of the second and third games in the Black Ops series. Along with standard multiplayer and co-operative Zombies mode (the latter of which includes new customization options and three maps at launch, two of which are built on a brand new storyline), the game includes a new survival-shooter mode. Called "Blackout", this new mode brings together classic Black Ops characters, weapons, game mechanics, and locations as up to 100 players (in squads of multiple sizes) fight to the death in one very large battlefield. After release a Battle Pass progression system was introduced which allowed players to unlock new emotes and skins for various characters within the game. These unlocks occur simply by playing the game in any of it's three modes. Players can also pay to speed up these unlocks. 533: We've Got the Truck Stick!